Eye-Fi’s new Mobi wireless SD card promises to make the business of wirelessly transferring photos faster, easier, and cheaper. While no longer a revolutionary concept, transferring via Wi-Fi and its attendant setup still can be a glitchy proposition for cameras without networking capabilities built-in. Eye-Fi has now taken this technology one zero configuration step further. 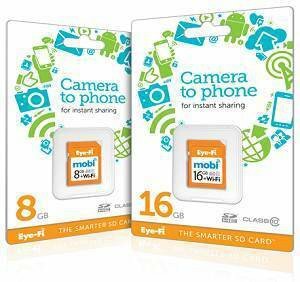 The Eye-Fi Mobi lets you connect directly to your smartphone or tablet, providing instant sharing opportunities as well as backup protection for your pictures. While some shooters are content with smartphone images, others seek to reduce the hassle factor of using their higher quality camera to share images on the go. The Mobi bypasses the computer and the cloud by transferring all the action to a free Eye-Fi app for iOS, Android, or Kindle Fire. Just enter the card’s unique 10-digit code to pair the card with one or more devices—no other setup is required. Once done, you can transfer high-resolution photos and videos to your device’s camera roll or gallery and send them on their way to friends and family or save them for editing. The card’s built-in Wi-Fi eliminates the need for a network, hotspot, or even an Internet connection: Images captured with the card are automatically copied to the designated devices when new images are shot. Like other Eye-Fi products, this Class 10 card works with a large number of cameras, including those featuring integrated Eye-Fi technology. Wi-Fi range is 90 feet outdoors and 45 feet indoors. 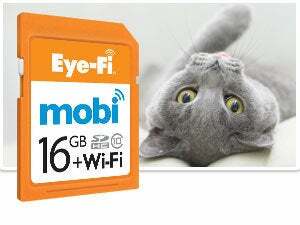 Eye-Fi’s Mobi co-exists with the company’s $100 Pro X2 16GB card, which supports Raw upload, wireless transfer to desktop computers, and cloud backup. The new Mobi is $50 for the 8GB card and $80 for the 16GB card. It supports JPEGs and video up to 2GB per file in a variety of formats (.mpg, .mov, .flv, .wmv, .avi, .mp4, .mts, .m4v, .3gp).